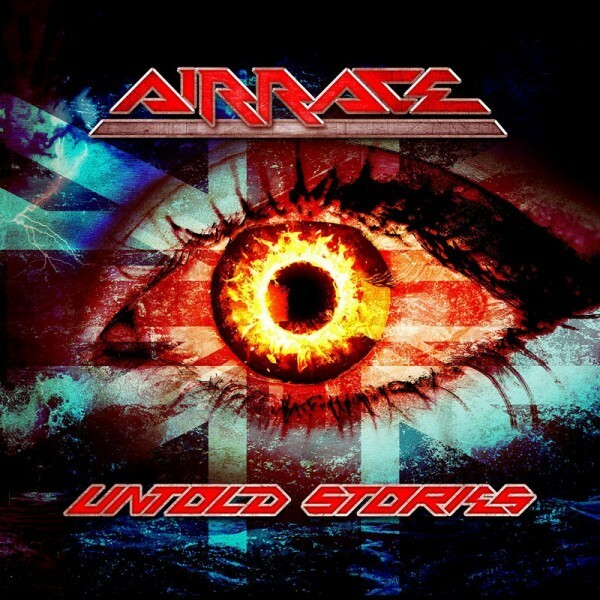 Prior to composing this review, I unearthed and reacquainted myself with Airrace's two previous albums – 1984's 'Shaft Of Light' and their long-awaited sophomore effort, 2011's 'Back To The Start'. Having digested all three over the past couple of weeks, I must emphasise that before you acquire 'Untold Stories', it's advisable that you place your romanticism for the band's past to one side as this third album encompasses a slightly restructured approach. Obviously, as this is a Frontiers release, the sound and production are of a high quality, it's rich and wholesome as well as embracing a more contemporary delivery. Conversely, those familiar with the band and its history will find much comfort in knowing that founder member Laurie Mansworth (guitar) is still present, thus providing the link to past "glories" and a sense of continuity moving forwards. Joining him are his son Dhani Mansworth (drums – The Treatment), Rocky Newton (bass – Lionheart), "Miss Feather Boa" herself, Linda Kelsey-Foster (keys) and the Welsh revelation that is Adam Payne (vocals). The album's opening gambit of 'Running Out Of Time', 'Innocent' and the superb 'Eyes Like Ice' set the standard extraordinarily high. These are perfectly executed AOR songs that are full of hooks, sing-along choruses and a vitality hitherto unwitnessed from this outfit. 'New Skin', 'Summer Rain', 'Love Is Love' and 'Here It Comes' are more praiseworthy examples of this. Front-man Payne is an inspired choice to deliver this type of material, as unlike his commendable (yet limited in vocal range) contribution on Serpentine's 2015 opus 'Circle Of Knives', he is allowed freedom to stretch his vocal cords each and every way, something he most definitely does with such panache and passion. However, we mustn't overlook his supporting cast as Laurie Mansworth provides some wonderful lead guitar accompaniment, whilst Dhani Mansworth and Newton underpin everything with rhythmic aplomb. Meanwhile, the keyboard skills of Kelsey-Foster ensure the peripheral sound has a gratifying silkiness. On occasion, the band cross the threshold of AOR into Melodic Rock territory; the Led Zeppelin-esque 'Different But The Same', 'Men From The Boys' and 'Come With Us' are solid songs with a diluted Classic Rock vibe. The solitary ballad 'Lost' (with Mansworth Snr. on lead vocals) is as good as anything you'll hear this year. A great effort from a much-revered band who can now hopefully grasp the future and begin to challenge the premier AOR big hitters. This is a very laudable release.